I had a realisation earlier this year that there are an infinite number of meaningful, exciting things to do. An infinite number of great projects to get involved with. And an infinite number of fantastic people to meet. Really, there is no end. But my time is limited. (This feels super obvious now, and probably something many of you have always known). But I have definitely been prey to saying yes way too much, and not having time for things that matter most to me as a result. 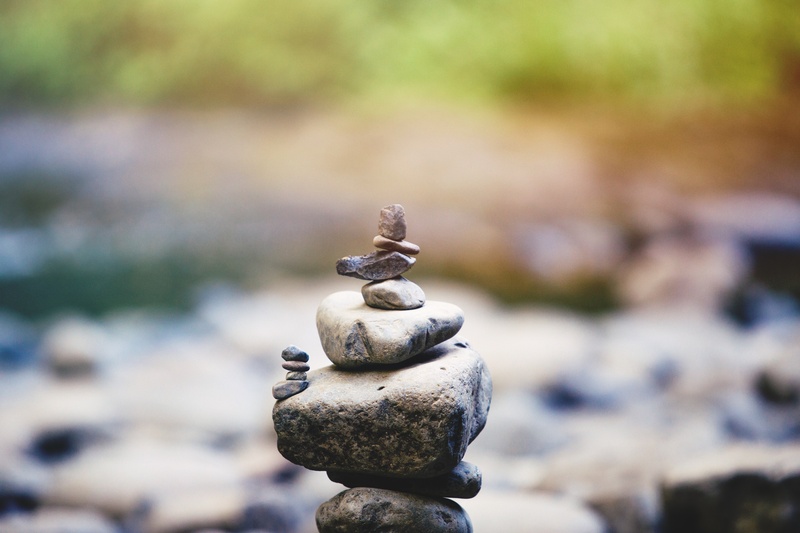 This topic of prioritisation and saying yes has come up frequently with a number of coaching clients these past months, inspiring me to to share a few reflections. By saying yes to all these opportunities (and choosing to prioritise them), I was lacking time for enough sleep, exercise, reading, spending time with people that mattered to me, playing music and going for nature walks. All things that didn’t have hard deadlines, that I don’t necessarily do for the sake of an output, but fill me up, bring me joy, and matter deeply. I used to tell myself that we are capable of anything and I really can make all of this work by being more effective. I’ve realised since, that whilst at some level I believe we are capable of far more than we think we are, this approach of saying yes and trying to make it all work, simply is not practical. 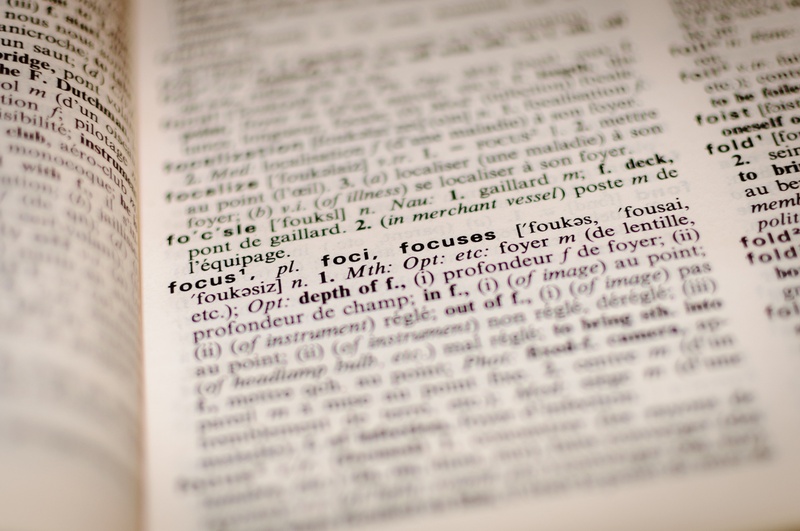 On the flipside, focus is powerful. And it can actually be super empowering to say no. Because saying no to others can simply mean saying yes to myself. Saying yes to sleep. Saying yes to that nature walk. Saying yes to that morning spent reading that book I have been meaning to. Saying yes to that cup of tea with a friend. So how do we know what to say yes to and what to say no to? Upon realising I had too much on my plate and this was taking away from things I wanted to do, I plotted my to do list on the matrix above. 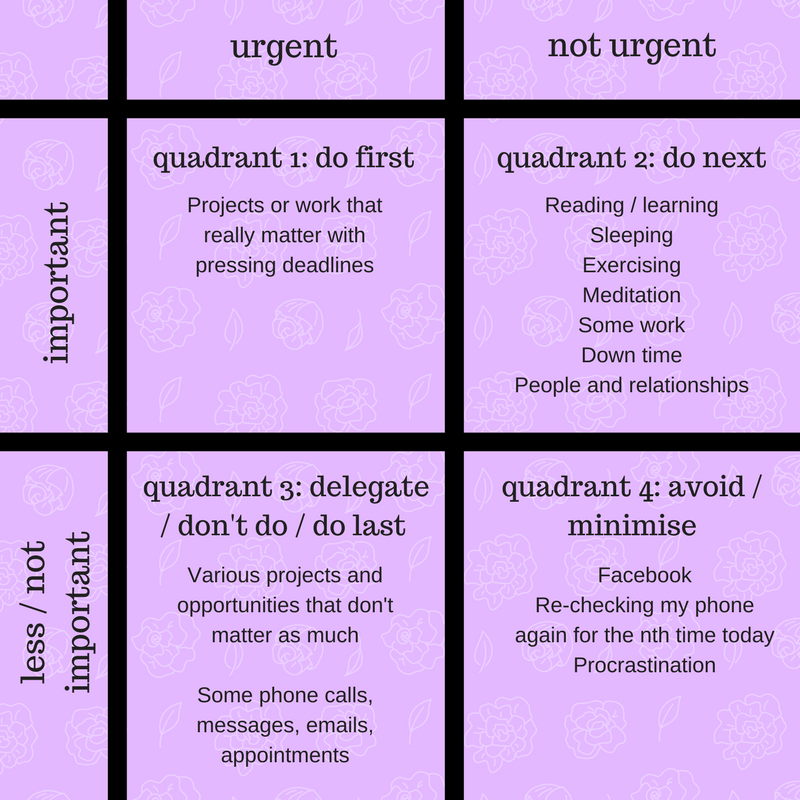 I quickly identified a number of projects/tasks that I cared about but were less important compared to other things (quadrant 3) and began delegating these. As new opportunities came up, I began to assess what else was on my plate, how important these actually were compared to other things and felt empowered to say no (despite being interested in them). It was strange at first, like any muscle I have found it takes training to strengthen. I’d often catch myself switching back to my default “yes” mode. But with practice, it has become easier. As space was created I began planning more time for myself and my wellbeing. More space for the things in quadrant 2. The things I cared about but previously struggled to make space for. The best bit is that as I do more and more of what’s in quadrant 2, quadrant 1 has reduced in size. I’m more energised, more productive, more focused, happier, and so less things end up becoming pressing deadlines . I found this matrix especially helpful earlier this year. For a month I was studying for a tough exam. All the blogs online suggested I dedicate several months to study and give myself time for several attempts. However I only had 1 month and 1 shot. So really this had to become my full focus. Studying for this exam was the sole task in quadrant 1 and warranted almost all of my waking hours. For this one month I had no choice but to say no to everything else. Many tasks that were once important became less important – just for that month. I had to say no to seeing friends. I sent apologies to multiple meetings. I said no to work opportunities that came up. I had to take a break from projects I was involved with. I had to delegate almost everything else on my plate – to the point that a to-do list of 20 odd things came to 5. The only time I left the house was to go on runs or exercise. It was hard. In many moments I thought I had to “fulfill my responsibility and show up”. I thought “I can’t my let my team down and be absent”. But the reality I discovered, is that people are fully understanding and the world moves on. We aren’t as important as we might think we are. And despite my absence everything continued, moved ahead and was done to a great standard too (dare I say better than if I was involved?) Humbling, empowering and freeing. At the core, the question I have been asking is “what matters most to me right now?” and “how can I live a life that aligns with this” knowing this will change as time passes. It’s easy to unconsciously continue to do what we have always done, but empowering to ask this question and really take a hard look at one’s life. Old habits can be ingrained so deeply, but it only takes small steps to experience change. And I feel fortunate and aware that given the privilege we have that we can quite freely make changes. It’s been inspiring seeing some of my coaching clients make meaningful steps toward doing the things that matter most to them and I hope I can continue to do the same! I’ve been doing lots of reflection lately on ‘how much time does self-care REALLY take,’ and realised that my most fulfilling days are those with lots of time spent doing this – and as much of it doesn’t have to cost a dime, it doesn’t necessitate having already built up the bank working long hours previously, either. I realised that I max out at about 4-5 hours of ‘non-self care’ time a day, so I would find it hard to sustain any more work than that…It’s funny, because I look back at my life and wonder, “How on earth did I manage to do all those things at uni and high school..all at the same time? !” Have you ever had that thought? 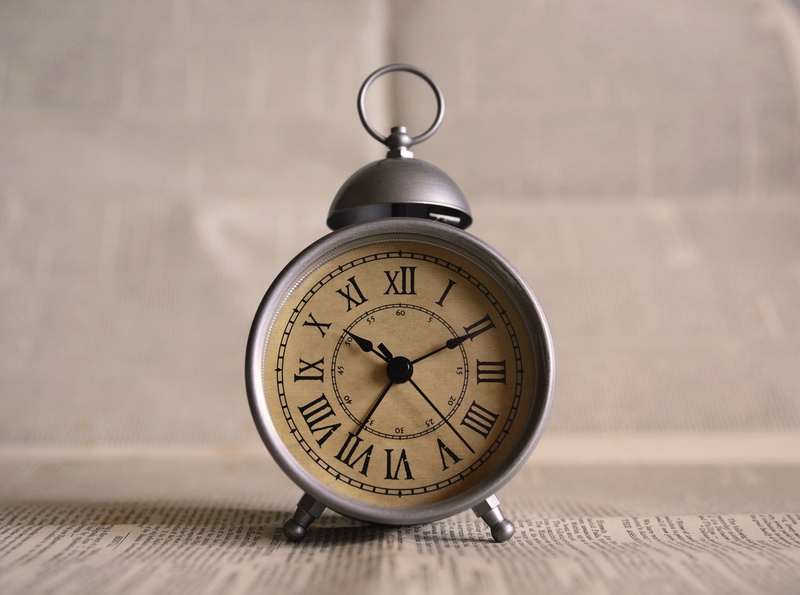 Does time seem to just shrink as we get older or are we really reckless enough in our youth to put up with epic levels of sleep deprivation and so on? (Although, I confess, whenever I think back to friends like you and Divya and Jade and Serena, I still am under the impression y’all are effortlessly steamrolling through this thing called Life like badasses. ).